Because we won't let you down; our silicone products are engineered using the latest technology, high quality raw materials and a continued investment in new tools, machinery and R&D. Our service levels are second to none and if not, we want to hear about it. 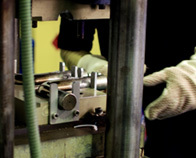 Right through from development, to design, manufacture and supply we are experienced, willing and able to assist with all your silicone tubing and fittings requirements. We are proud to export silicone mouldings and extrusions all over the world and with over 25 years in the industry we have developed an impressive track record for quality. Choosing Silclear means choosing a silicone supplier with integrity; a thorough understanding of silicone, the manufacturing process and an industry trusted reputation.